Wow! 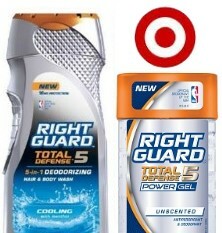 We have two great new Right Guard Target Coupons to print & stack for a very nice deal at Target! Buy both and pay .88 cents for both or .44 each after stack! The Target Coupons don’t expire until 12/31 so you can always hold onto them for now in hopes of a price cut or sale- we often see the body wash at $3 and the deodorant for around $2.79 – but print now while they are available! I see both these coupons at zip 90210. If you need to change your zip just click on the “local coupons” tab at the top then input the zip 90210, and then switch back to the coupons tab. You can then click on the link above and the coupons should come right up & already clipped for you. My Target always gives me a hard time about these types of Target Web Coupons because they don’t print the bar code numbers or the fine print inside the boxed coupon area. @Shanna Are you using Mac? this happens to me as well so what i do is just borrow my siblings’ computers which are Windows. I tried troubleshooting it but to no avail. i think there are compatibility issues with the applet installed. I apologize. I had a blonde moment. I found it now. Guess I got too excited and didn’t read the whole message! I went to do this today and can you believe the cashier said I could only use the MQ coupon or the Target coupon because the MQ said one coupon per purchase. Was not even going to argue, called corporate and made a complaint. I did this deal tonight as soon as I saw it posted on here. I used 2 of the $3.00 right guard body washes, along with 2 of the target $1.50 coupons. i ended of paying .49 cents each for four of them. I had had several problems with couponing at target for 2 yrs. It got to the point i was being harassed for complying with their coupon policy. I was going to file a class action suit and told target so. Finally had enough, and I called the main corporate office number, not customer service and spoke with a higher up. No problems now. Just for your information. You are allowed to use 4 of the same Target coupons, and you can also stack 4 manufacture coupons with the same deal. like this one here posted. If the cashier gives you a hard time, bring your coupon policy and if that doesn’t work call and complain. the bottom line is management and cashiers are not up on Targets coupon policies and that’s when the customer is NOT getting the complete fulfillment of couponing. Hey Ann- you can use up to 4 identical coupons unless otherwise stated on the coupon- which is why I have the scenario how I do. While Target insert coupons limit you to 4 per identical per visit, target printables always limit you to one per guest. @ Teresa P. The next time a cashier tells you that you can only use one MQ because it states “one per purchase”, ask them, “but how many am I purchasing?”. My Target has the deodorant for $2.99 regular price. Luckily my Target is also very generous and lets me use more than 1 identical Target coupon as long as I am purchasing the correct number of items. I was able to buy 2 of the deodorant using the $3/2 MQ and 2 of the $1.50/1 deodorant TQ, getting them both for free. my store refused to accept both MQ and TQ at the same time. Two managers looked at MQ and said because of its wording “not to be combined with any other offer” I could not use TQ. Left the store disappointed. I got a good deal on Halls cough drops. Bought six 30ct bags at $1.19= $7.14, used three MQ $1/2 and two $1/3 TQ from pharmacy booklet. Paid $2.14 or 36 cents each. My hubby will be happy about this one. Thank you! I was using Chrome and while I don’t have Firefox installed I did have IE so I tried and it worked!